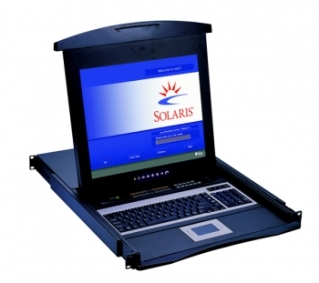 This 1U 17" / 19" LCD keyboard drawer is compatible with SUN Solaris and supports SUN 1152 x 900 & native resolution. It is direct compatible with SUN and USB server and available with or without integrated KVM switch. 104-keys SUN compatible keyboard w/ 3 button trackball supports SUN keys including Stop, Cut, Paste, Compose etc.